I have a confession. Even though I sometimes write out a shopping list, I often don't, and when I do, I frequently leave it at home. That means that I end up buying more of some things than I need. Every fall, I find myself picking up one more can of pumpkin when I'm at the store. What to do with the extra pumpkin after the pies are all made? Of course, I could save it for next year, but where's the fun in that? Instead, I made a delicious bread pudding that uses just a few ingredients and bakes up warm, slightly sweet, and really flavorful. I served it warm with a topping of cool, sweet Coco Whip. 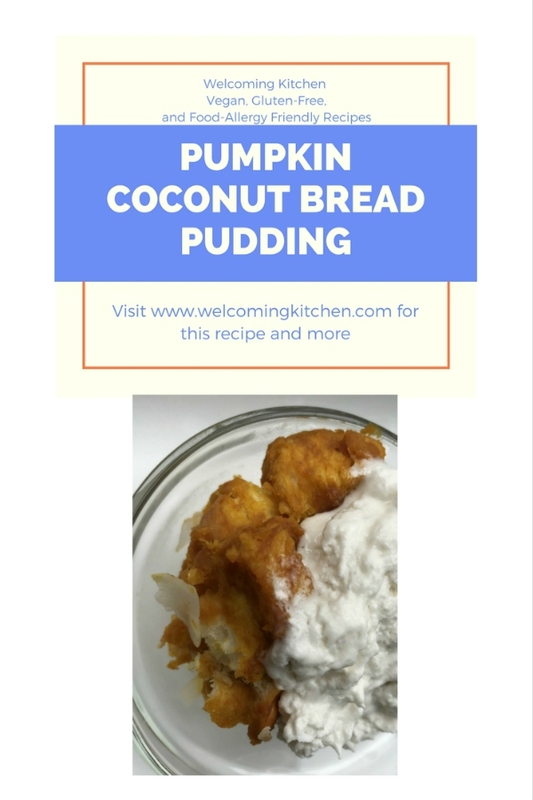 I had never used sweetened condensed coconut milk before this. It was really nice. It was thick and creamy and sweet with a hint of coconut flavor. Note: Use whichever bread you like that fits your dietary needs. Dinner rolls work really nicely for a bread pudding, in my opinion. Lightly toast coconut flakes in a dry pan over medium heat until fragrant, but not burned. Tear or cut bread into chunks, 1-2 inches. 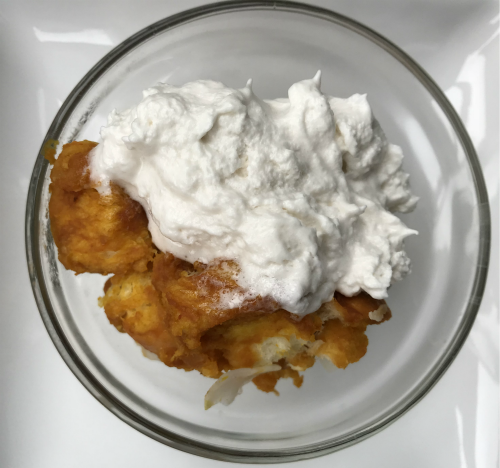 In a large bowl, mix together pumpkin, sweetened condensed coconut milk and salt. Add bread chunks to pumpkin mixture and stir to coat. Spread in a 9 x 13 inch pan, and top with coconut flakes.